When Motorpsycho released an uncompromising country album a few years back, it was clear that Norway had more to offer than good indie rock, black metal and fjords. 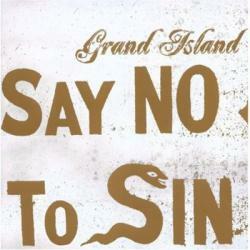 Grand Island are also deeply rooted in ancient Americana, as if they missed the chance to be featured on the soundtrack from the movie O Brother, Where Art Thou? Inspired by bluegrass and Appalachian folk music, Grand Island combine those ingredients with garage punk and groovy rock’n’roll. Even if there might be a lot of academic musical musings in their songwriting, already the opener Love Is A Dog From Hell proves that all this crossovering works perfectly well. As if the Cramps were sped up and left behind their rockabilly attitude, or as if Captain Beefheart had played Trout Mask Replica faster and less angular. There you have it: speed is one of the main aspects of Grand Island’s sound, and how they know to handle it. Vintage keyboards and banjo add the country elements, but at times their material is also modern enough to appeal to fans of contemporary indie rock bands like the Strokes and the likes. As the album is filled with smashers (Set You House On Fire, …And Then I Still Said Yes To Sin and the exquisitely poppy final track The Inbetween Is The Everything) and there are absolutely no fillers, I don’t hesitate to give one of my rare maximum ratings, especially since Say No To Sin is a great alternative rock album far away from contemporary hypes and trends.